My dear friend Patty Wysong has a ministry she calls "Take Flight" on her blog and Facebook, where she helps bloggers with ideas for blog posts and blogging in general. I've participated once or twice before (I think!). If you need blog post fodder, it's a GREAT place to hang out. Last Thursday, she put out a challenge that I'm taking up today: a progressive interview. A whole bunch of folks put a single interview question at the Take Flight Facebook page, and we went about answering them. And each person posted the answers to THEIR question on their blog, along with a link to the people who answered. SO - if you go to the links attached to each quote, you can see A DIFFERENT question, and other folks' (including my!) answer to their questions. Fun, eh? Or, just and check out the folks who have linked up at the bottom of each post. And without further ado (that was A LOT of ado, eh? ), here is my contribution. Please read and enjoy my question (and answers) - and click on the folks' pictures below and check out OTHER interviews! 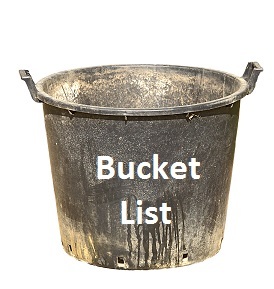 QUESTION: What's on your bucket list? Name at least two things you'd like to do before you leave earth, and why. Sharon Clements Srock: A trip to the opal mines in Australia. Opals are my birthstone and I've always been fascinated with their color. Scuba dive. I love to snorkel, but I'd love to take it to the next level. Diane Lesire Brandmeyer: Take a train trip to Alaska with my husband. He's been there and wants to go back and share it with me. Go to New York City to the button store. I don't know why this is such a big deal to me. I just want to see all of those buttons! I love to sew and buttons that are unique are a bit hard to find where I live. Valerie Friesen Comer: Hmm. Two items on my bucket list? I'd love to travel to England sometime and steep myself in some history. Where I live in rural BC, Canada, we're still celebrating centennials of when towns were established, etc. I think we don't even have a concept of the many layers history can provide in places where civilization has been in place for thousands of years. As an author, I'd like to hit the NYT bestseller list someday. Hey, why not dream big? Yes, I'll need to sell more than the novella that's about to be published, but God, my agent, and I are working on that! Linda McQuinn Carlblom: 1. I want to get my three already written books for kids published because I think they'd be a great read for kids and would draw them closer to God. 2. I'd like to go on an overseas mission trip partly for the adventure, but mostly to spread the love of Jesus. Donna Winters: Go to Alaska. Go to Hawaii. I'll probably get to those places as a widow since my husband doesn't like to fly. Maybe we could strike it rich and take a boat. He does like boating. Good thing. We're surrounded by lakes here in Michigan. Sharon Hoover: I want to live in a geodesic dome on a mountain lake; and I want to publish a novel. :-) P.S. Diana's train trip to Alaska is now on my bucket list, too! Janet Sketchley: Go on a river cruise. Probably Europe. Because rivers are cool and the scenery would be amazing. Skydive. I think. Because if I didn't die of fright it'd be awesome. Kristi Peifer: I would like to travel to Europe and Australia. I've never been off the continent of North America! I'd also really love to play the parts of Dolly Levi in Hello, Dolly! and Maria VonTrapp in The Sound of Music. Christine Rich: Two things on my bucket list are visiting Israel and Ireland/Scotland. And MY answer? I really, REALLY want to go to the Grand Canyon some day, and to Israel. Grand Canyon just because it sounds so beautiful and awesome - and Israel because of my Jewish background AND coming to Christ - would so love to see the place where the patriarchs - AND my Savior - walked. Hope you'll check out the linky gadget at Patty's blog, or click through the links on this page to see the other interview topics and questions. Fun stuff, eh?? So, what's on YOUR bucket list? I'd like to see the USS Arizona Memorial and associated area in Hawaii. I'd like to get all the Arizona-based historical novels running around in my head written before I kick the bucket. Even though I never liked the phrase "bucket list", reading the answers and writing one was lots of fun. Thanks for your post! Lots of traveling - does it go along with a passion for writing? Explore new places. I'd love to go back to the places I lived/visited as a child: England, Ireland, Scotland...let's just lump it under world traveling.